Women's large camera bag from Parisian label, KENZO. Crafted from smooth leather with a structured silhouette, the 'Icon' design showcases two zipped compartments with a printed lining and multiple slip pockets internally. 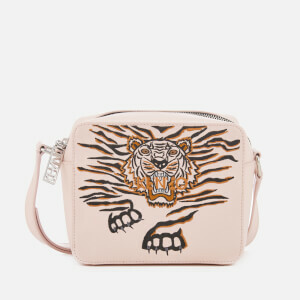 Features the brand's signature embroidered tiger logo to the front and rear. Complete with silver-toned hardware and an adjustable shoulder strap. KENZO branded zip pulls. Outer: Split Leather. Lining: Cotton/Polyester. Trims: Polyurethane.